Boom 9,6 m to 38,0 m five section full power boom. 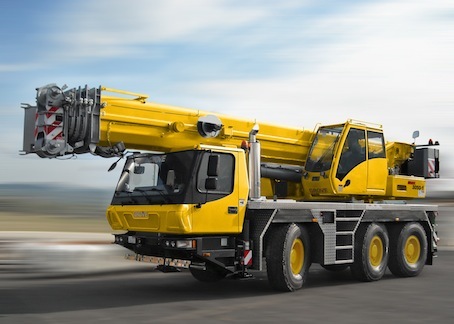 Maximum tip height 40,0 m.
Optional equipment • Bi-fold swingaway, 8,7/15 m with hydraulically offset and luffing under load(0°-40°), controlled from the cab. Cab Aluminium, 2-man-design, safety glass, driver seat with suspension, engine-dependent hot water heater. Complete instrumentation and driving controls. 60° tilt forward for engine access. • Engine Tier 3: Mercedes-Benz OM 501 LA, 260 kW, max. torque 1730 Nm at1080 rpm.